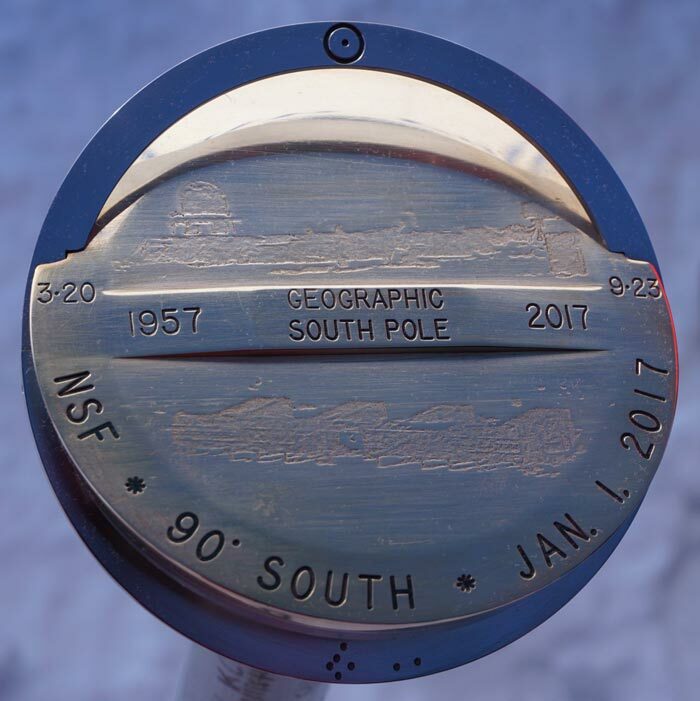 1573 people have wintered over at least once at the South Pole between 1957 and 2019. Since some of these folks wintered more than once, there actually have been a total of 1956 winterover positions. And if you haven't found the winterover lists yet, they are included, along with photos and other information as available, in the timeline entries for each year through 2018 at this point. Actually I should also say that there is a complete database spreadsheet, with winterover numbers, updated through 2019 on this web site, slightly hidden to protect the list of names from spammers. Access is available to Polies upon request. Although it is obvious that I've made errors and omissions in the past, I'm pretty confident that the basic list of folks is complete and accurate, if only because it has been more than eleven years since someone wrote me claiming I'd left someone out :) Suggestions/corrections...please let me know! In 2019 there are 42 NPX winterovers--37 men and 5 women--two more people than in 2018 which saw the smallest crowd since 1998 (before the new station construction began). The largest crowd ever was in 2005 when we had 86 folks, including 24 women! In the old days, the first three years with women (1979-81) the crews included only one woman--in hindsight that experiment was probably not the best idea. At left, a view of the main second floor hallway and the gallery of winterover pictures dating from 2012 back to the first winter in 1957...most of these were hung, edited and/or reframed by Andy Martinez and Terry Eddington during the 2007 winter (Antarctic Sun article). Some of the frames were fabricated with wood from the old Dome sauna or gym floor. 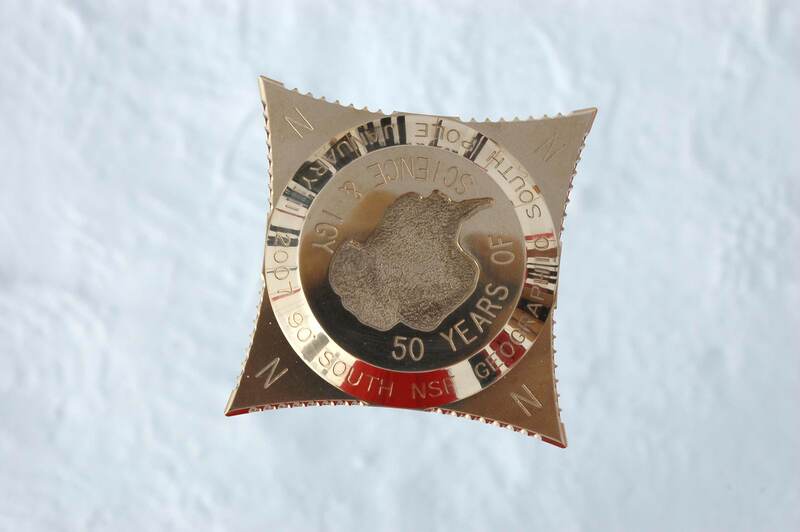 We are still missing a few pictures...1960, 1962, 1963, and 1968 from the Navy days and 1976, 1979, and 1986 from the dome era--you know who you are :). 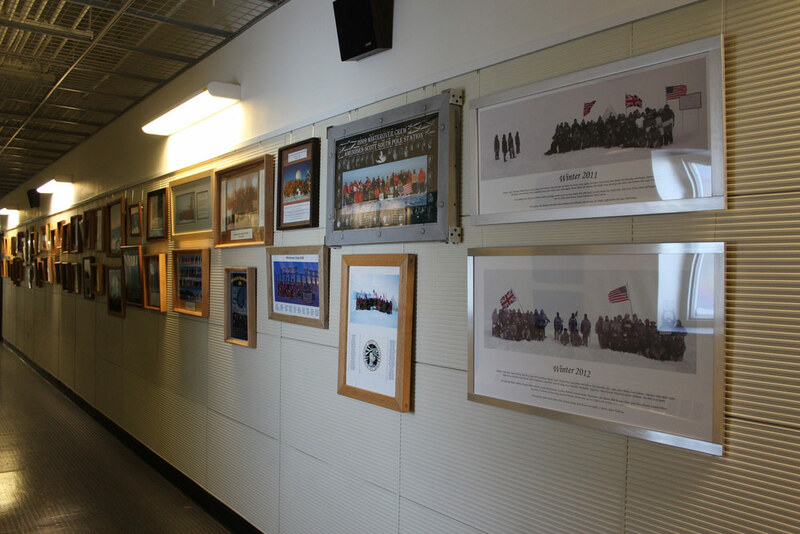 This photo by 2012 SPT winterover Cynthia Chiang shows those 2011 and 2012 photos that include the members of Amundsen's and Scott's parties. Twenty of the 2019 winterovers have previously wintered at least once. The top leader in this category is, of course, Robert Schwarz, who has said that his record 15th winter--the ninth in a row, is his last. Others this year with multiple winters include Dennis Calhoun with 6 Pole winters, Steele Diggles and Bill Johnson with 5, Lester Lemon and Clint Perrone with 4, and Viktor Barricklow, Catherine Dudley, Luis Gonzalez, Doug Howe, Martin Keefe, Aaron Phelps, Ray Reed, Gavin Reynolds, Dave Riebel, Steven Sanders, Ta-Lee Shue, and Wayne White with 2 winters. created by winterover machinist Steele Diggles. More information! Something more arcane that was updated in 2015 but which is of interest at least to me...during the Navy days, none of the OIC's ever wintered more than once at Pole in any capacity (although several wintered elsewhere). During the Dome era, many of the managers had previously wintered in another position--the first of these being Tom Plyler who was the power plant mechanic in 1975 and manager in 1981. Now, three managers to date have subsequently returned to winter again in another position: Don McCreight was the manager in 1997--he returned in 2015 to winter as carpenter foreman (and has been back for the past couple of summers as well). Gary Freeman was manager in 1992 and returned as SEH coordinator in 1995. And Bill Spindler, who was manager in 1977, returned to winter in 2005 as Title II inspector and in 2008 as a project engineer. Martin Wolf, BICEP3 winterover Grant Hall...and of course machinist Matt Krahn. That gap of 28 years between my winters is (I believe) a record for people wintering at American stations, although I don't have complete statistics for McMurdo. But...it is NOT the overall record, as I recently heard from Brian Jury, who wintered at Mawson in 2017. 31 years before that he wintered at Casey. I'd like to think THAT is the record. News for the ages as it were, 2018 winterover physician Malcolm Arnold is the oldest person to winter to date. He had that record in 2008 when he was 65 at the end of the winter...so ten years on he was 75 at the beginning of the winter (in 2019 he's at Palmer for the winter). He beat out 2011 physician Jim Borden who turned 74 in July of his winter. For the women, things are a bit more complicated. 2011 greenhouse tech Susan MacGregor (now Susan Batenhorst) had her 62nd birthday in mid-May of her winter. Dr. Betty Carlisle had her 63rd birthday after her 2001 winter ended, so she was 6 months older than Susan. But...Betty wasn't around for the entire winter, she showed up in April 2001 on the medevac that took out Dr. Ron Shemenski. 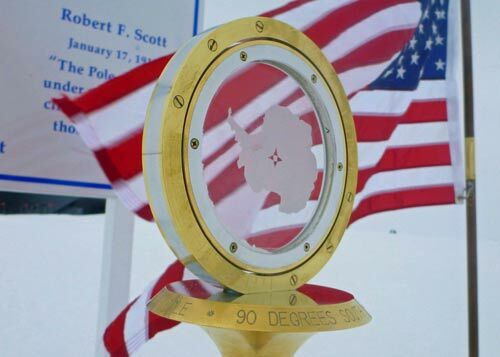 So Susan is the oldest woman to spend an ENTIRE winter at Pole...as well as the oldest woman 300 club initiate. As for the youngest Polie winterovers, we had at least one in 2008: carpenter Andy Titterington and comms tech Shaun Meehan, were age 18 when they showed up at the beginning of the summer. Shaun turned 19 on 14 December, and Andy turned 19 a month later on 13 January, making Andy the youngest w/o Polie, beating out Larry Duckett, the 1975 winter cook, who was 19 when he showed up at the beginning of the 74-75 summer, and Eric Siefka, who was also 19 when he wintered in 1982. Oh, for 1 day there were 3 19-year-old w/o's on station, but UT Aditya Tata turned 20 on 14 January 2008. As for the youngest woman to winter..still researching that. Remember that all of these statistics are strictly voluntary...but one of the 2018 women was 22.
and created by machinist Matthew Krahn (info and photos). In 2007, Robert Schwarz alone held the record for six winters. But he wasn't back until 2011, so Johan Booth, Barry Horbal and Steffen Richter caught up with him in 2008, and Johan and Steff later passed him up. In 2013 Robert caught up with them, so the three of them (Johan, Steffen and Robert) all had 9 winters. In 2014, Robert and Johan were back again for winter #10, and they were both back in 2015 for winter #11...and in 2016 for #12. Robert has continued on and now has the record 15 winters, while Johan is back for his 14. Behind Robert and Johan, Steffen Richter has 9 winters, and Barry Horbal and Dana Hrubes have 7. Behind them, Dennis Calhoun is in his sixth winter, seven people have five winters: Tommy Barker, Tracy Blair, Steele Diggles, Bill Johnson, Heidi Lim, Rod Jensen, and Jake Speed (Joseph Gibbons). Jake was the first to reach this milestone. (He was back at Pole for awhile in the 2007-08 and 2008-09 summers, but he'd been spending some of the "off seasons" at Summit and/or with wife Kath) and after what happened to him in Greenland in 2009 he had to recover from losing some limbs at Summit. Twelve people have wintered a total of 4 times. In addition to 2019 winterovers Lester Lemon and Clint Perrone, this group also includes Allan Day, Kaycee Flaugher, Weeks Heist, Drew Logan, Paul Lux, Jason McDonald, Sue O'Reilly, Jack Sharp, and Kevin Shea, and Kim Williams. machinist Anton Brown. (info and photos). With 3 winters, there now are 52 people...Derek Aboltins, Brien Barnett, Dave Benson, Kevin Berck, Hans Boenish, Rhys Boulton, Yubecca Bragg, Betty Carlisle, Robert (Gumby) Carlson, Clayton Cornia, Ethan Dicks, Nate Dyer, Terry Eddington, Tom Edwards, Lis Fano/Grillo, Ethan Good, John Hammon, Slay Harwell, Bill Henriksen, Katie Hess, Kitt Hughes, Katy Jensen/McNitt, Travis Kamiya, Matthew Krahn, Ricardo Lopez, Erik Lund, Tim Markle, Janice Martin, Jon Martin, Sheri McKeen/Mason, Jason Medley, Jed Miller, Joshua Neff, Matt Newcomb, Jon Olander, Lee Parker, John Parlin, Kris Perry, Michael Rehm, John Richard, Elizabeth Rose, Eric Sandberg, Derek Sargent, Neal Scheibe, Mike Scholz, Rob Shaw, Will Silva, Paul Smith, Jason Spann, Bill Spindler, Leah Webster, and Noah White. 164 people have wintered twice. In 2019 Robert Schwarz is in his ninth consecutive winter, now well ahead of Jake Speed's five winters in 2000-2004. People with 4 consecutive winters include Kimberly Williams as of 2018, Kaycee Flaugher as of 2016, Heidi Lim and Kevin Shea as of 2008, and Allan Day and Barry Horbal as of 2006. The group with three consecutive winters now includes Brien Barnett, Johan Booth, Rhys Boulton, Clayton Cornia, Lester Lemon, Ricardo Lopez, Jason Medley, Sue O'Reilly, Michael Rehm, Steffen Richter, and Mike Scholz. No one else has more than two consecutive winters. 2014 machinist Matt Krahn (details and more photos). In the new station era, there were only 43 people wintering in 2009--as construction on the new station was winding down. And there weren't any records in 2009...except perhaps that there were only 4 returning winterovers--an unusually low number for recent times. That low number is not at all unusual--in the old days there weren't many returnees--in my first 1977 winter we were all FNG's. All of the returning 2009 winterovers (Todd Adams, Weeks Heist, Lance Roth and Jack Sharp) were around with me in 2008 for their first winter. This has brought up the question--how many women have wintered? Well, thanks to some male and female Pole Souls and Polies who helped me clear up my questions about ambiguous names, as of 2019, the total is 235. This includes one person, Heidi Lim (now married and named Heidi Rehm) with 5 winters, three--Sue O'Reilly, Kaycee Flaugher, and Kimberly Williams--with 4 winters, 12 with 3 winters, 27 with 2 winters, and 192 with one. The first woman was Michele Raney, the doctor in 1979, and the second was Martha Kane Savage, the cosray observer in 1980--both of whom are great people and good friends. Initially this was considered an "experiment" and there were only one or two women at Pole during the winter. Thankfully the powers-that-be decided to quit experimenting a few years later and get with the times. 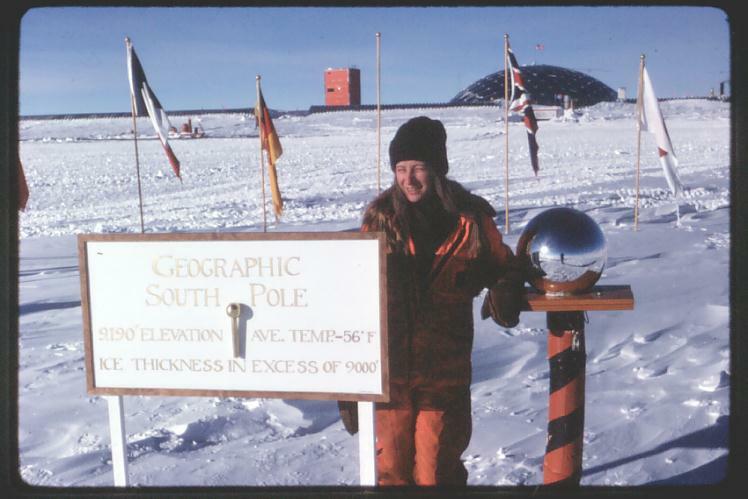 The first woman to winter at all 3 of the current US stations was Carol Crossland...she wintered first at McMurdo in 1991, then (after a few summers here and there) at Pole in 1998 and Palmer Station in 1999. As for the second woman to do so (that I know about), she's Wendy Beeler, who wintered at Palmer in 2006, Pole in 1999, and McMurdo in 1992 and 1998. Yubecca Bragg completed the hat trick at McMurdo in 2008. More recently, Rachel Javorsek finished a 2012 winter at Palmer Station...she wintered at Pole in 2011 and at McM in 2008. And the newest addition to this list is Clair Von Handorf, who was at Pole in 2014 after wintering at McM in 2009 and at Palmer in 2010, 2011, and 2012. As for the men...it turns out there have been a number of them. 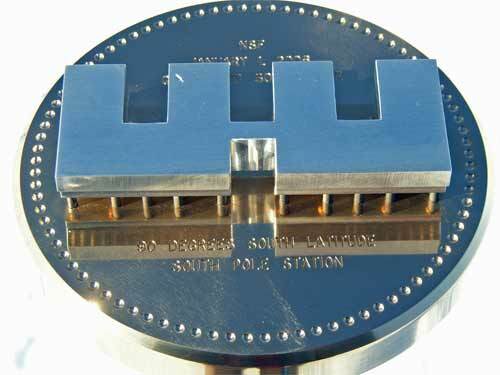 The first of these was cook Harvey High, who wintered at all 3 stations with the Navy--1963 at McMurdo, 1966 at Pole, and 1970 at Palmer. Harvey was scheduled to winter at Pole with H&N in 1979 but he was medevaced with pancreatitis before station closing...and in 1982, while working as second mate on the Hero, he fell to his death from the ship to the drydock floor while the ship was in drydock in Talcahuano, Chile. Oh, the most recent addition to this list is satcom engineer Mike Rice, who wintered at Palmer for the 2018 winter after his most recent Pole winter in 2017. Interestingly, Mike showed up at Palmer along with FOUR other 2017 Pole winterovers! Additionally (in no particular order as I don't have all the data) we have at least Robert (Gumby) Carlson, Larry Mjolsness, Jim "Thumper" Porter, Al O'Kelly, Paul Lux, Jordan Dickens, Jack Anderson, Brad Kuehn, Paul Daniels, Jed Miller, Damien Henning, Bob DeValentino, Zachary Morgan...I understand at least 39 folks may have wintered at all of the 3 current stations so I've obviously missed a few. pictures of the marker and the unveiling ceremony. Another interesting overall program statistic...as of the 2018-19 summer season there was only one person on the ice for their 40th consecutive season...Rob Robbins, and that was duly celebrated at a McMurdo party! Jules Uberuaga, who was on the ice for 38 consecutive seasons through 2016-17, stayed home in 2017-18. For the past two seasons she'd been working as a grantee equipment operator for NASA's LDB project...but that was cut back this year, so she stayed home in Idaho (and complained that there wasn't enough snow for skiing). Jules did her first season in 1979-80 as a GFA at Pole. She was interviewed by several TV stations in September 2012 before heading south for her 34th season...as of now, this interview with Boise's KNIN is the only one still out there. Rob's work involves diving...despite global warming, fortunately there is not much call for that specialty at Pole--yet. 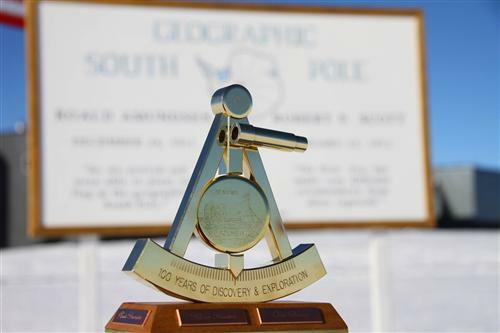 But Rob's long history in the program was noted in this November 2015 Antarctic Sun article. As for family members wintering, the most recent new statistic is from 2017 when two twin brothers, Jack and Ryan Clifford wintered together, both working in IT. The first two family members to winter at Pole (not in the same year) were brothers and scientists Henn Oona in 1964 and Hain Oona in 1968 (as of February 2012, Henn (Hank) and Hain were both still working at Los Alamos National Laboratory). Their family emigrated to the US from Estonia when they were young boys...so it also seems that Henn and Hain are the only two Estonian-born folks to winter. The second two brothers to winter were Bill Smythe (UCLA gravity, 1977) and brother Chuck (NOAA, 1979). There have since then been several married couples (as well as a few couples who met at Pole and got married later), as well as the father-son team of computer tech Cleve Cleavelin and his son Chris who wintered together in 1997.
rest of the story about the marker and the installation ceremony. 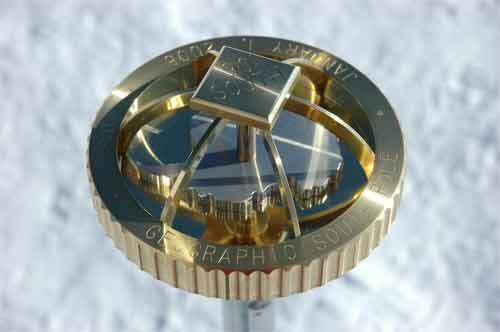 People representing nationalities other than the US in 2019 include supply person Viktor Barricklow from Sweden, BICEP3 observer Ta-Lee Shue from Taiwan (he also wintered in 2017), three Germans--astronomer Robert Schwarz along with IceCube winterovers Benjamin Eberhardt and Katrin Mallot, and two Australians--machinist Steele Diggles and power plant mechanic Dennis Calhoun. (Note that the nationalities in these statistics include people who were originally from these countries or people with dual citizenship). In 2016, the PM foreman Alex Teixeira was originally from Uruguay. 2015 saw the first winterover Thai--met person Supria Calvert-Reisner--as well as the first Iraqi--facilities engineer Nizar Hashemi. In 2014, IceCuber Dag Larsen was the first Norwegian to winter--rather surprising considering that the first five Polie visitors who returned home to tell their tale were Norwegians. In 2013, Ice Cube team member Felipe Pedreros Bustos was the first Chilean to winter at Pole, something a bit surprising given Chile's extensive involvement in the Antarctic over the years. And Blaise Kuo Tiong, the other IceCuber, was born in Manila--his family relocated from the Philippines to Los Angeles when he was nine. He's the second Filipino to winter...the first was Cesar Ambalada who wintered in 1966, he was the electrician (a US Navy EM1, first-class electricians mate--quite impressive for the time, as few Filipinos in the Navy back then had technical rating jobs). The other two non-Americans to winter in 2013 were that indefatigable German Robert Schwarz, and Aussie Steele Diggles. And in 2012, plumber Jean-Pierre (JP) Brunel, was the first Québécois to winter. JP grew up in Québec speaking only French until he moved to Colorado later in his adult life. 2012 brought the the third Spaniard to winter--Carlos Pobes was one of the two IceCube scientists. The first person from Spain to winter was US Weather Bureau meteorologist Luis Aldaz who wintered twice, as station science leader, in 1962 and 1965. The second was Francisco Navarro, the 1984 UCLA scientist. 2012 also included cook Kasia (Kate) McGrew from Poland. The first Japanese-American to winter was US Weather Bureau researcher Fred Mayeda in 1959...but he was an American citizen. The first Japanese citizen showed up to winter a year later in 1960--Dr. Masakiyo (Henry) Morozumi, studying auroras, with the Arctic Institute of North America--he used to have a web site but he is still out there . The first Hispanic was Jose Gomez in 1961...the first African-American was probably Rod Miles in 1969 (another had wintered at Byrd in 1961). The first Canadian to winter was 1973 Navy mechanic Gerald Davis who was originally from Canada. There have been a total of 17 folks with Canadian heritage, including 3 winter site managers. Here's the list of all of them. The first Russian (Soviet) exchange scientist was Peter Astakhov in 1967; he was followed 10 years later by Alex Zaitsev in 1977. A year later in 1978, Alex was followed up by Rurik M. Galkin in 1978, and Yuri Latov wintered in 1982. From the post-Soviet era, Russian Nikolai Makarov wintered in 1995, and Ukrainian Nick (Nicolai) Starinski wintered in 1999. The first Australian was Barry Woodberry who came down with the US National Bureau of Standards in 1966. The second Aussie is also notable--Graeme Currie wintered in 1981 (he wintered eleven times at various ANARE and other stations)...the first Australian woman was AST/RO observer Jules Harnett in 2004. There have been at least 18 so far who have wintered, most recently including the 2019 machinist Steele Diggles and power plant mechanic Dennis Calhoun (the list of Australians). 1966 was a rather cosmopolitan year at Pole. In addition to Barry Woodberry from Australia, the winterovers with non-US citizenship included the Bartol cosray researcher Lars Andersson from Sweden, and Navy electrician EM1 Cesar Ambalada from the Philippines. Speaking of Swedes, there now are four--in 2019 materials person Viktor Barricklow returned (he also wintered in 2017 and has dual Swedish/US citizenship). SPT observer Daniel Michalik, with dual Swedish/German citizenship, wintered in 2017. Earlier, there were IceCube guy Sven Lidström; he wintered in 2007 and was back for 2012, and cosray observer Lars Andersson in 1966. From a bit south of Sweden in the Low Countries, there have been two Belgians--Freija Descamps, one of the 2011 IceCube observers, and Jean-Marie Moreau, the 1990 doctor. And Erik Verhagen, with IceCube in 2009, was the first Dutch citizen to do so. 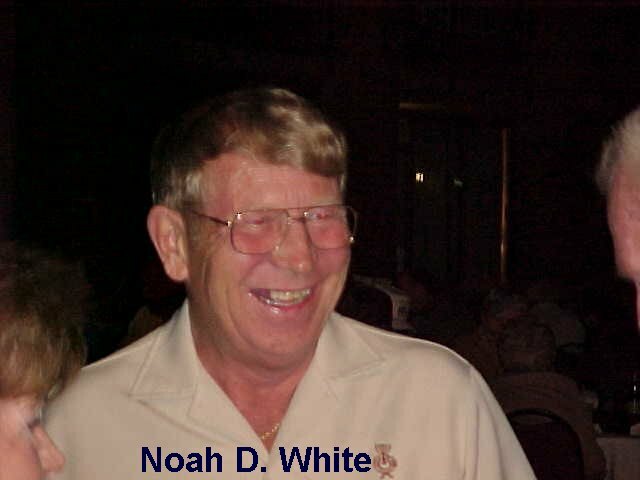 Noah White, radioman/comms guy, wintered three times in 1967, 1970, and 1979. He's the only person to winter both at the original station (Old Pole) and under the dome, the only person to winter both as a Navy man and a civilian, and the first person to winter three times. Yes, I've met him, he was a good guy, sadly, he passed away in early 2019. 1995 and 1996 were interesting winters...1995 was the last year WITH a scheduled midwinter airdrop and WITHOUT internet. 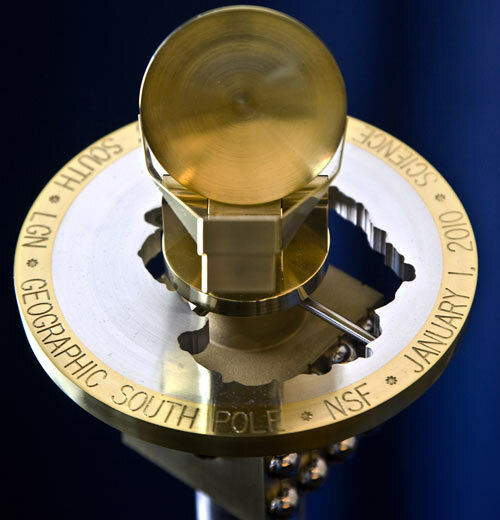 They also were the first years when anyone wintered consecutively--Australian astronomer James (Jamie) Lloyd and NOAA science tech Jeff Otten wintered in both 1995 and 1996. Back to nationalities...it now seems that the first German to winter did so back in the real old days of 1972--gravity geophysicist and German citizen Walter Zürn, who was spending time at UCLA after graduation from Stuttgart. Next was 1983 w/o geophysicist Hans-Albert Dahlheim, who was studying the gravitational pull of the Moon (and won the Round the World Race). Matthias Rumitz (AST/RO) and Robert Schwarz (AMANDA) were next, in 1997. By now there are twenty total...here is the list of Germans. 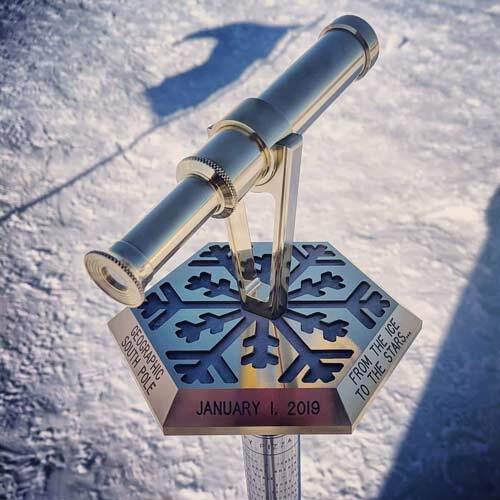 As for the French, probably the title for the first man goes to the 2006 BICEP researcher Denis Barkats, and 2009 IceCube w/o Camille Parisel is the first woman--she previously spent 14 months at Dumont d'Urville through the 2001 winter. There have been two Italians--the 2018 WSM was Marco Tortonese, who also wintered in 2011 as a science tech. The first Italian was Paolo Calisse, the 2003 VIPER/AASTO winterover. 2010 (and 2011 and 2012) brought Ricardo Lopez, the first Polie originally from the Dominican Republic, and 2005 featured the first Jamaican, HR person Kurt Montas. photos of the ceremony are here. Laser scientist Ashraf El-Dakrouri, who wintered in 2000, was the first Egyptian (and the first person from any Arab or Muslim nation) to winter at Pole (profile article from the 16 January 2000 Antarctic Sun). Hein Van Bui, the 1988 w/o computer tech, was the first person from Vietnam to winter. He was followed by Hien Nguyen, the 1994 SPIREX researcher/SSL; and Xuan Ta, the 2004 Title II inspector. There have been three Chinese (PRC) citizens to winter: AST/RO astronomer Xiaolei Zhang (1998), AMANDA researcher Xinhua Bai (1999), and Kecheng Xiao (AST/RO, 2002). 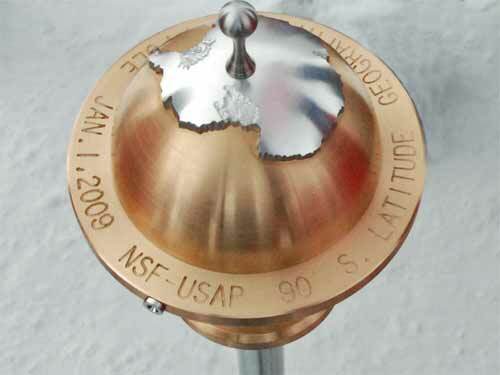 We've had three people from India winter...the first was Roopesh Ojha, a citizen of the Republic of India who wintered with CARA/ASTRO in 1999. Also there with him that year was science tech Reza Mossadeque (of Indian and Bangladeshi origin, although he was an American citizen when he wintered). Next is 2007 w/o Karthik Soundarapandian, another India citizen, who wintered and is currently working with IceCube. From the UK I believe we have had thirteen winterovers (which includes a couple of folks with dual NZ/British citizenship), most recently there was 2009 SPT astronomer Ross Williamson (list of British citizens). And from an emerald island next to the UK it seems 2010 winter site manager Mel MacMahon claims both Irish and Canadian heritage, and 1990 CUSP associate Richard Collins was an Irish citizen. 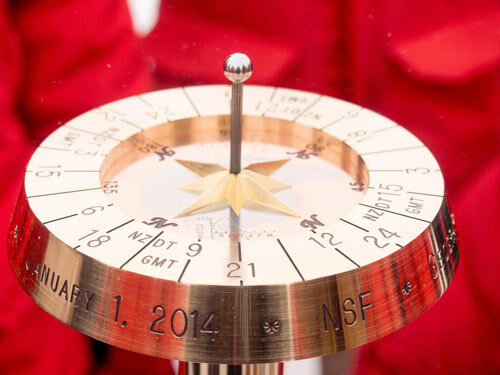 From elsewhere in Europe, note that 2012 cook Kate McGrew was the first Pole to winter at Pole (!) From a bit south of there, Monique Gerbex, the 2003 work order planner, hailed from Switzerland. Finally, back in the US of A (but not the 50 states), electrician Osvaldo Torres, who wintered in 2004, is from Puerto Rico. again, each dimple represents one of the 64 winterovers. Some station management statistics (these refer to the winter site manager, not the area manager/resident manager position, which was created for the first time for the 1977-78 summer). The year before then, the station manager had, shall I say (since it was I ;-), a bit more to do during the summer: For the 2005 winter--Bill Henriksen was the first person to return for the second time as manager--in 2003 he had the same job (his first winter was as Title II inspector in 2000). 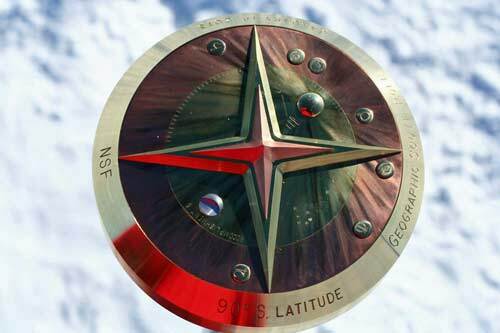 In 2006, 2007, and 2008 he wintered in McMurdo as the NSF manager. Katie Hess, the 2008 manager, returned to do that again in 2012. Janet Phillips in 1994 was the first female manager. 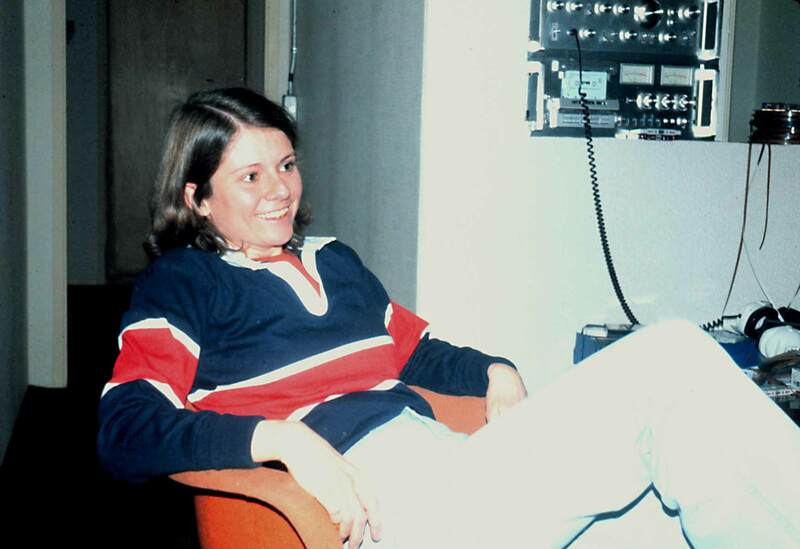 After the McMurdo winfly, all 3 US stations had female management for the first time--Karen Schwall at McM and Ann Peoples at Palmer as well as Janet (her article about the experience). Oh, Janet went on to manage Palmer Station in 1996. Three managers during the civilian era were last-minute replacements--Dan Morton in 1976, Rich Wiik in 1983, and Dennis O'Neill in 1991. Rich and Dennis had been at Pole, scheduled to winter in other positions, but Dan had NOT worked at Pole and was not originally scheduled to winter until 1977. All 3 guys are friends of mine and did well. Last but not least, some statistics that had nothing to do with Pole until 2014. For a number of years since 2004, power plant mechanic Rocky (Gerald or Gerry) Ness held the all-time record for 15 Antarctic winters--all at Palmer and McMurdo. But in 2014 that record was broken by two people. 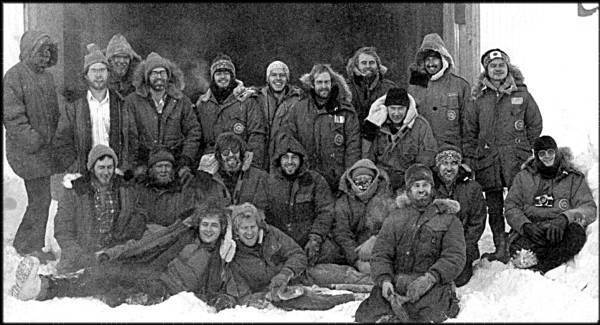 At McMurdo, George Lampman had his sixteenth CONSECUTIVE winter...all of them at McMurdo, more recently as operations supervisor. He was documented in the film Antarctica: A Year On Ice. 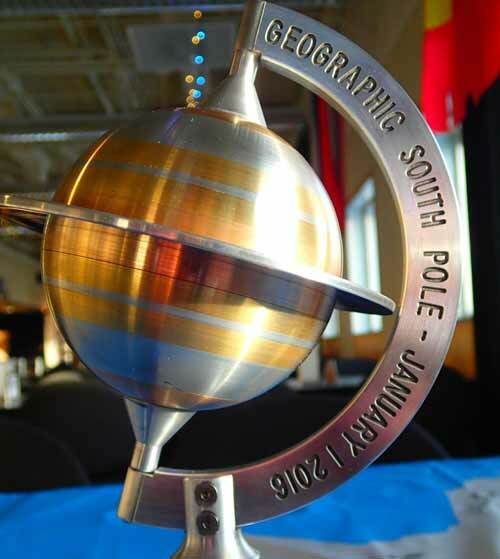 And at Pole, Johan Booth also had his 16th winter in 2016, none of which have been at McMurdo. Both George and Johan had their 17th winters in 2015. Johan had his 18th winter in 2016. but George did not. As of 2016 the undisputed record holder for women was Wendy Kober who had her 15th winter that year. Previously in 2015 Wendy had tied Angela Garner at 14 winters. Angela wintered again in 2017, so the two women Wendy and Angela are tied at 17 winters. Back to the men...there is a new contender. 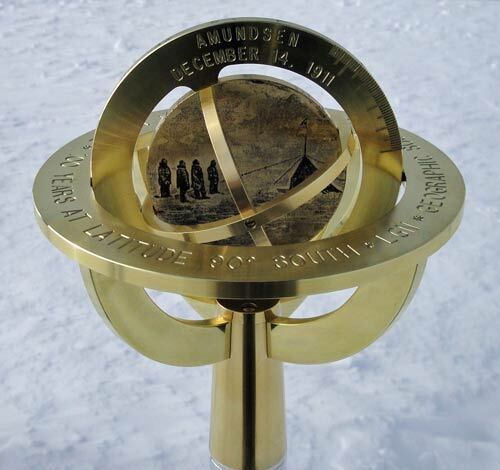 Rex Cotten is currently at McMurdo in his 19th winter, so as far as I know, he and Johan are tied for 19 winters. With the twist that ALL of Rex's winters have been at McMurdo, while NONE of Johan's winters have been at McMurdo. Yes, I know, there must be more vital stats--send em to me!! 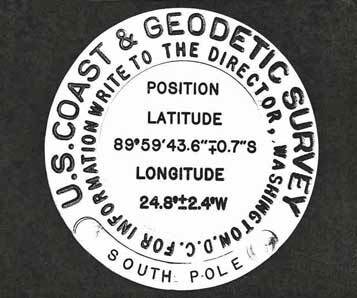 Okay...as a bit of trivia I must add this bit of information about the 1997 Pole marker, as I get asked about this now and then. A summer visitor acquired a copy of it and later tried to sell it...on an episode of Pawn Stars first aired by the History Channel in December 2009. The episode gets aired now and again more recently, and it's also available online...hence these details. 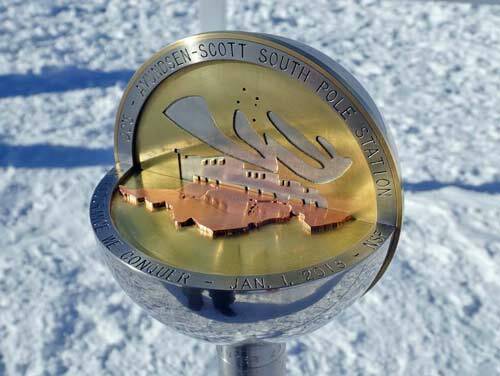 Above...an image of the very first (and long-lost) South Pole marker, manufactured in Washington DC and hand-carried to the station during the 1959-60 season. 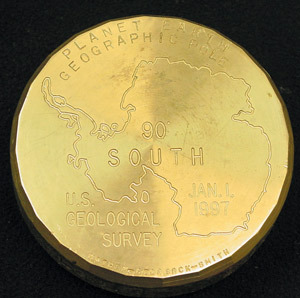 It does not say "90º South" as it was not placed at the Pole, but inside the original station, where it presumably still is today. As with the one at left, multiple copies of it have been in play-- most recently, it was up on eBay in January 2016 (it didn't sell). Here's the rest of that story. Thanks to Katy Jensen, who originally crunched the data to produce many of the statistics you see here. Please recognize that the nationality information is based only on published publicly available data and voluntary contributions. Credits for the photos at the top of the page--the group in the left photo is the 1957 team, note Paul Siple in the back row (caption and more information); and the motley crew in the right photo is, of course, us 1977 Pole Souls :). The panorama below is the 2004 w/o picture, by Glen Kinoshita.